Redmond O’Toole is recognised as one of the most distinctive and original guitarists of his generation. He was the first to adopt Paul Galbraith’s ‘Brahms guitar’. This groundbreaking instrument and technique uses an 8-string guitar in the position of a cello. 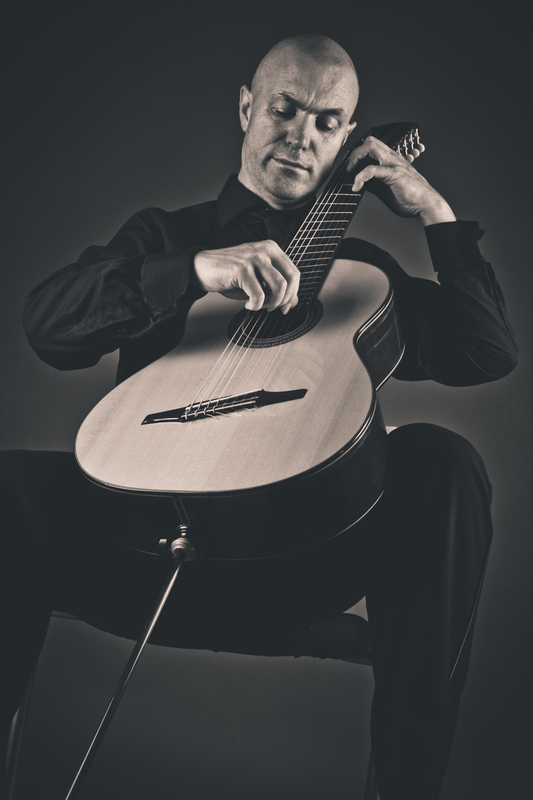 He has performed at major concert halls and events throughout Europe such as Passau International Guitar Festival, Germany, Irish National Concert Hall, Royal Dublin Society Concert Hall and Hallein Guitar Festival, Austria . He has performed as soloist with orchestras such as BBC Ulster and the Irish Baroque and has toured extensively as guitarist for legendary Irish group ‘The Chieftains’. He teaches at the Royal Irish Academy of Music in Dublin. O’Toole is an important ambassador for the classical guitar in Ireland and has given concerts the length and breadth of his country. He has performed for two Irish Presidents and was part of the televised concert for Queen Elizabeth’s historic visit to Ireland in 2011. He is a member of the critically acclaimed Dublin Guitar Quartet. O’Toole’s principal teacher was Oscar Ghiglia with whom he studied privately in Athens, Greece and at the Accademia Chigiana in Siena (under scholarship). Prior to that he studied at DIT Conservatory of Music and Drama in Dublin. During his time at DIT he won an unprecedented number of awards for guitar, most notably the RDS Music Bursary ( Ireland’s largest Music Prize ). In 2008 he was the recipient of an Irish Arts Council Bursary which supported intensive periods of study over a three-year period with lutenist Nigel North at the Jacobs School of Music, Indiana. Redmond has to date recorded three CDs ; ‘Movements’ and ‘Baroque’ for German label Bornheim Klassik and ‘October on Achill’ for VGO recordings (San Francisco). He has premiered numerous contemporary works by composers by Nico Muhly, Kevin Volans, Marc Melitts and Ian Wilson amongst others. Redmond is from the Seaside town of Bray in County Wicklow where he now lives. He has previously lived in Frankfurt and London and is married to contemporary dancer and educator Antje Schneider O’Toole. I’m Mimi from liscannor, just to say hi. Still loving your music. Lv from liscannor. Great to hear from you mimi! Mr. O’Toole, would/could you edit/arrange Segovia’s Diatonic Scales for 8 string guitar? I have created scales , various kind for practice on the 8 string. I never wrote them out. I’m sure you could organise your own with a little imagination! Mr. O’Toole, I am Hung Tran a classical guitarist who designed a similar 8 string guitar in 1990, so I am impressed of your work. (I have built my own repertoire for 8 string by transcribing Chopin and Bach works). However, I am having a difficulty with the 1st (A) string. I am currently using German fishing line for it, but I hope you have a better one. Can you please provide me the info how I can get this A 1st string? Thank you for taking time to answer carefully my question. I tried to find the contact page so that I can write this but I could not. Again, thanks a lot for your time.